Kerry Haynie, associate professor of political science and African and African-American Studies, was elected the new chair of the Academic Council this past Thursday. Haynie will succeed current chair Don Taylor, who finishes his two-year term on July 1. Haynie defeated Mark Anthony Neal, James B. Duke Professor of African and African-American Studies, in a closed ballot vote. Both candidates had long records of university service. 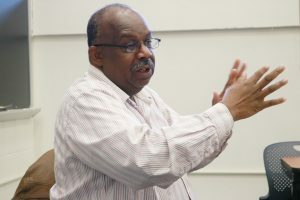 Haynie, who also serves as director of Duke’s Center for the Study of Race, Ethnicity, and Gender in the Social Sciences, has served multiple terms on the council and has been a past member of its executive committee. Neal is currently serving on the executive committee. He has also served on a number of presidential and provostial committees and council committees, such as the President’s Working Group on Community and Dialogue, the Provost’s Committee on Reimagining Doctoral Education, the Undergraduate Education Committee of the Board of Trustees and the Academic Council’s Diversity Task Force. As council chair, he will take the lead in guiding the faculty’s role in shared governance at the university. In other council news, Dr. Geeta Swamy, vice dean of the School of Medicine and associate vice provost for scientific integrity, presented revisions to the Misconduct in Research policy in Appendix P in the Faculty Handbook. The revisions provided clarification of policies, some of which went beyond regulatory requirements while others weren’t aligned with routine practice. It confirmed that the policy was applicable to university researchers other than faculty members. In addition, the definition of research misconduct is limited to falsification, fabrication and plagiarism, while removing other kinds of misconduct, such as deviations from standard practices. Swamy noted that some misconducts, such as harassment, are not covered by this policy but both Duke and by national professional associations will continue discussing them. The topic of faculty behavior has been a regular part of the council discussions this year, and it’s likely some new policies will come out of that work. “These are things we are working toward, but they are separate from this research misconduct policy,” she said.